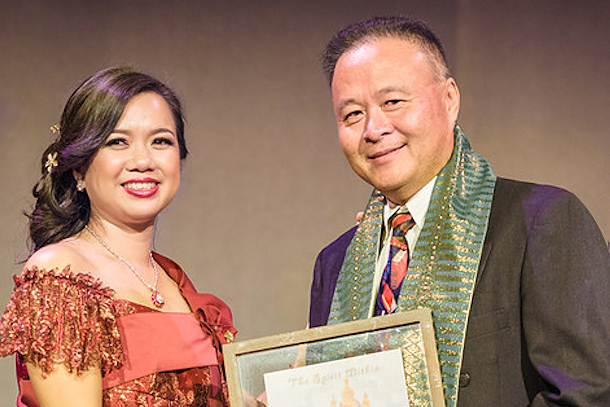 United Cambodian Community honored teacher and translator Darith Ung recently with the Rumdul Blessing Award for his more than 22 years of service to Cambodian families. Ung accepted the award at UCC’s 40th Anniversary Gala. “Throughout your years in education and through your partnership with UCC, you have established a strong foundation of support for the Cambodian youth of Long Beach,” UCC Executive Director Susana Sngiem said. Ung serves as a bilingual Khmer teacher on special assignment, translating materials for the school district and teaching four levels of Khmer at Wilson High School. Khmer is the primary language spoken in Cambodia. Ung also teaches a Khmer language class at Cal State Long Beach. Ung started with the school district as a school community worker at Lincoln Elementary School and soon began working at LBUSD’s central office. Applauding Ung at the awards event were Board of Education President Megan Kerr and fellow board member John McGinnis. LEGACY OF IMPACT – Susana Sngiem, executive director of UCC, presents the Rumdul Blessing Award to teacher and translator Darith Ung for his legacy of impact in Long Beach and the Cambodian community.